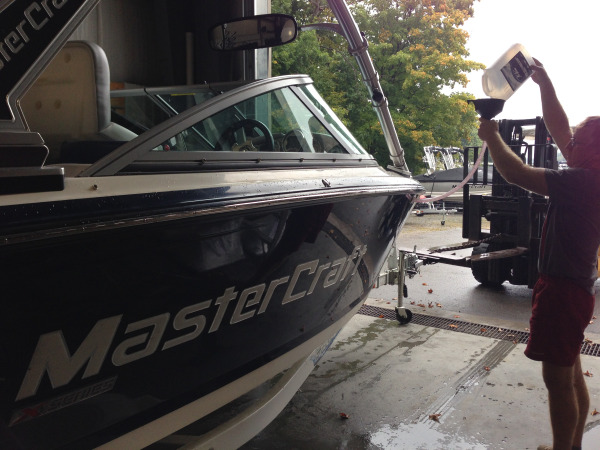 What does it take to winterize and store an inboard towaboat (MasterCraft, Nautique, Malibu, Moomba, other) for our Eastern Ontario winters? Good question and we are glad you asked. In fact, it's a common question when someone is considering storing this type of new or used boat. Lake test and assessment of all equipment. Any deficiencies/suggestions noted and communicated to you by email (anything repairs suggested are for your approval). We do a complete walk around with you at your boat when you drop it off also and note your needs at that time. Haul out your boat, complete a hull pressure wash, chemical bath (acid), soap and water scrub, and rinse. Fuel system stabilization (engine is run with stabilizer in the tank during lake test). Engine oil and filter changed (MasterCraft approved parts only). Inspect other lubricants (transmission and power steering). Inspect all hoses, belts, connections. Heater draining and antifreeze (in equipped). Check charge of and disconnect battery(s). Ensure boat is dry and tidy before storage, tag with name and notes about possible work necessary. Shrink wrap with ventilation (if this is the package chosen). Store inside or outside as selected in secure and protected yard/building. Spring prep, install plugs (engine block and hull), install any hoses disconnected for winter, clean battery terminals and connect. Launch, lake test, and verify equipment is working. Load on trailer or leave at dock for pick-up (as selected). Bonus #1: Earn AIRMILES® Reward Miles on your contract (service, and parts) and any winter work you elect to have completed. Also, if you are an existing Len's Cove Dockage and/or storage customer you can earn a referral bonus of extra AIRMILES® - ask us how! Bonus #2: Take advantage of winter work for repairs, upgrades, preventative maintenance while you are not using your boat and be ready for spring. We keep our technicians on all winter long. That's about it! Throw in an incredible staff who cares about your boat, great training, the right equipment, proper insurance, and the vision to make your winterization and storage a great part of your boating story, and you'll be ready to roll next spring! If you want more information, please contact us directly, or check out the MasterCraft Boats resource page at this link here.